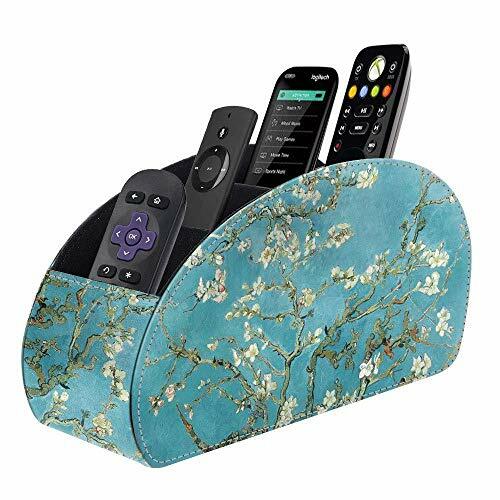 Fintie remote stand holds up to 5 TV remotes, stereo remotes, soundbar remotes or game console media remotes and also works as office supplies desktop organizer. Stable upright design with flat bottom allows easily access to apple TV remote, Fire stick, Roku control or any other media essentials without tipping it off. The organizer caddy is constructed with high density board with padded vegan leather exterior and anti-scratch microfiber interior, lightweight and durable. Measures 8 x 4 x 2.8 inches, it fits any coffee table, bedroom desk or workbench perfectly without taking up much space. Stylish design adds a visual splash of style to your living room. Nice gift for housewarming or job promotion.